David Random is the most down-to-earth man, but his imagination is endlessly floating around in outer space. After a long and successful career in the ad world, he started his own art studio to create these fantasy sculptures. 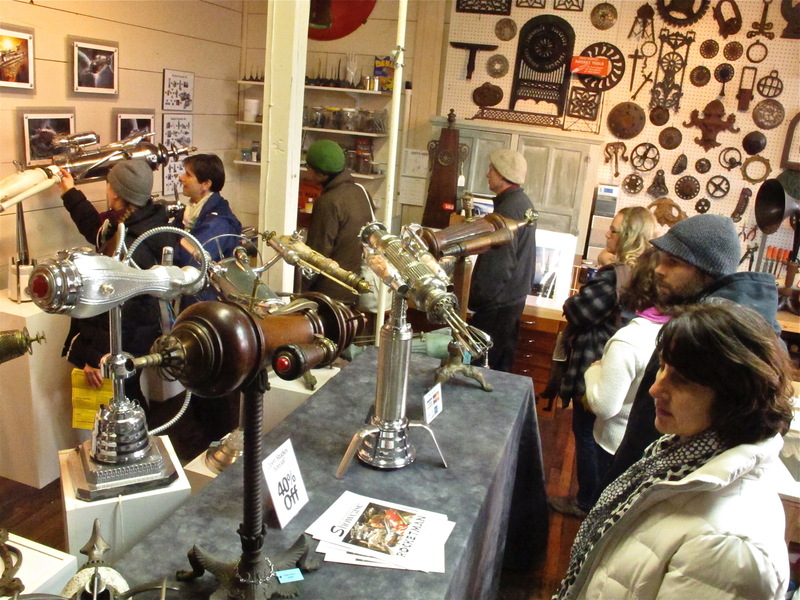 He searches and finds antique and vintage items and reclaims them into steampunk space sculptures. The anatomy of one rocket ship, Baby Boomer, is a pair of binoculars, waffle iron, vacuum tube, test tube of plastic babies and whisks. 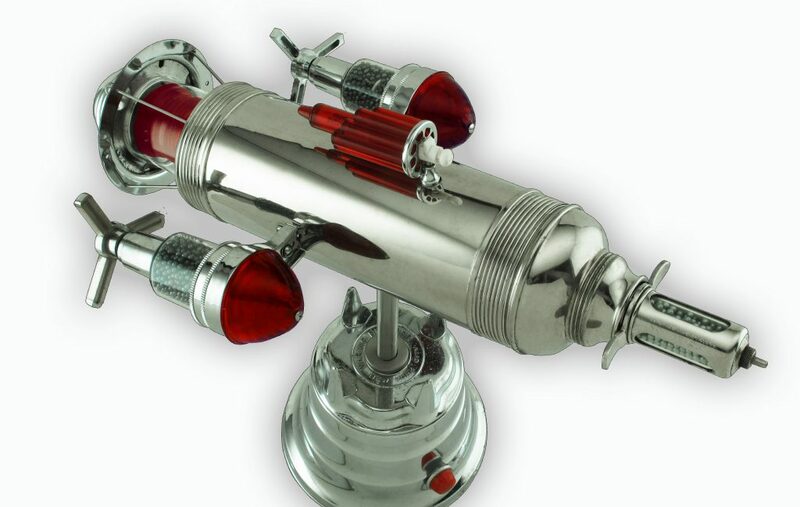 His rocket ship sculptures ignite the imagination to blast off into space and will make you look at every day appliances in a new light. His creations even inspired an award-winning short film called Rocketship created by Alfred Thomas Catalfo and Glenn Gardner. 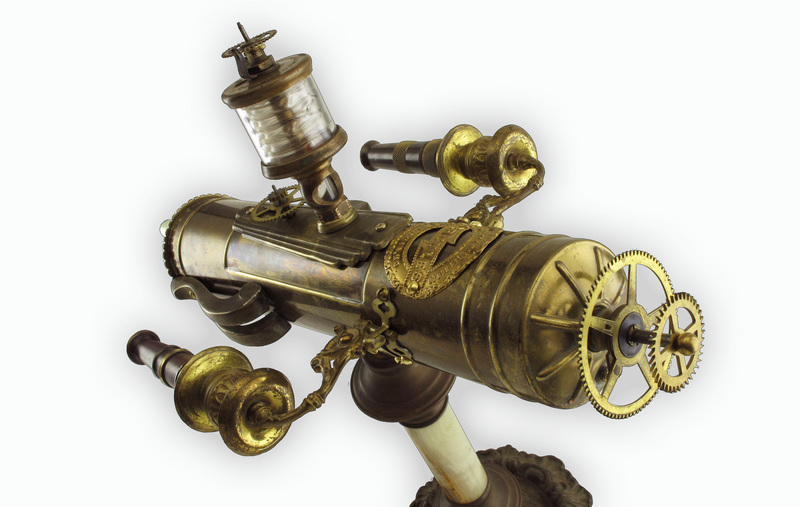 DR: My pieces evolved from both a love of antiques and a childhood fascination with Jules Verne and Flash Gordon whose imaginations took them into space decades before scientists actually made it possible. Their fanciful rocket ships were beautifully aesthetic and eclectic collections of gears and flourishes, often defying aerodynamics. But they remained in my mind as wonderful, whimsical spacecraft worthy of praise. DR: One of the most unique things about living on the seacoast of New England is the abundance of antique shops and flea markets. This make finding parts for my creations easier than it might be in other areas of the country. While this is helpful in collecting potential parts, that process is by no means easy. 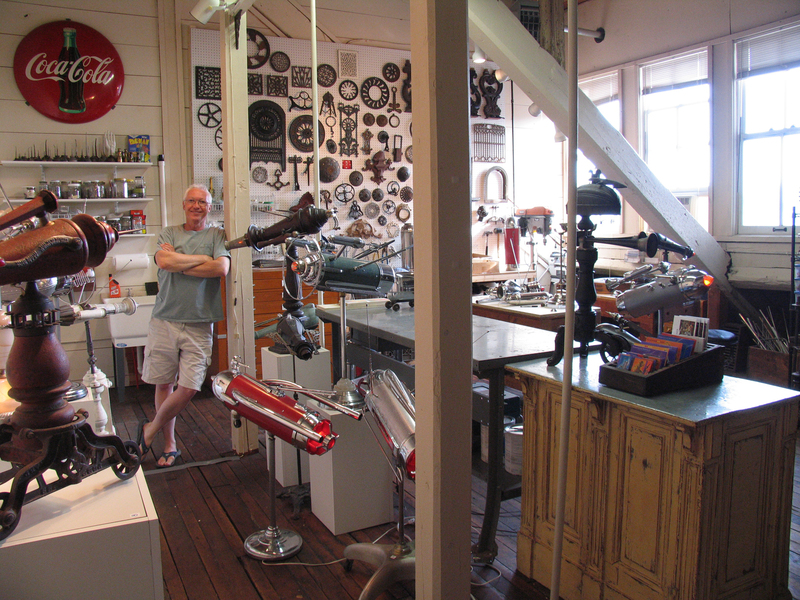 I need to keep an inventory of thousands of potential “rocket ship parts” in my studio at all times in order to increase the possibility of having the perfect one I need at any given time. Because I use only antique and vintage parts, I can’t just run down to the hardware store every time I need something. When you travel, how do you find souvenirs for yourself and loved one? DR: I travel a lot. When I do, I bring back things that remind me of where I’ve been, and I try to find items I cannot get anywhere else. Sometimes I bring back gifts for family and friends, but sometimes I look for items to keep for myself as reminders of wonderful trips. I like to go to shops that do not carry the typical souvenirs manufactured specifically for tourists. Travel to the great beyond and explore David Random’s other rocket ships here.